Currently in the midst of running their second three-tier satellite online poker tournament series for seats at the PPC Aruba World Championship 2016, Intertops Poker and Juicy Stakes revealed that their third and fourth array will also hand out prize packages valued at $4,000 and encompassing the $2,400 main event buy-in along with $500 for travel expenses. Scheduled to take place from November 2 to 7, the PPC Aruba World Championship 2016 will feature a three-day main event from November 4 with a $500,000 guaranteed prize pool while winners of the travel packages from Juicy Stakes and Intertops Poker will additionally receive five nights accommodation at the Hilton Aruba Caribbean Resort And Casino or the Hyatt Regency Aruba Resort Spa And Casino as well as buy-ins to two smaller tournaments and dinner and a night out with the team from one of the online poker domains. 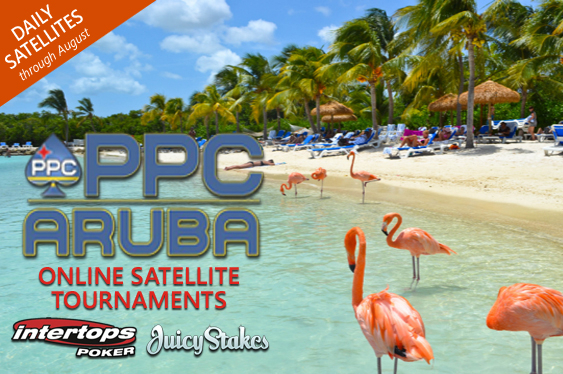 “There will be lots of tournaments and lots of opportunities to win some cash in Aruba but there will also be plenty of time for fun in the sun on a beautiful tropical island,” read a statement from Intertops Poker. Vincent Fiorenza won the main event of the PPC Aruba World Championship 2015 for a cash reward of $106,047 and is due to defend his crown in November. Coming three-tier competitions will award two players with main event seats into November's PPC Aruba World Championship 2016. Juicy Stakes and Intertops Poker declared that players can register for either of the upcoming three-tier competitions at any stage via their tournament tabs while winners will to join previous champions in having their experiences abroad featured on the Living The Dream blog.